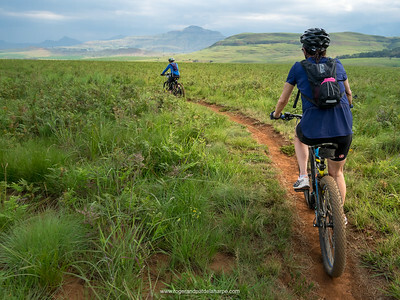 Drakensberg Mountain Biking - Roger and Pat de la Harpe Photography - Photographs, Video and Stock Images. 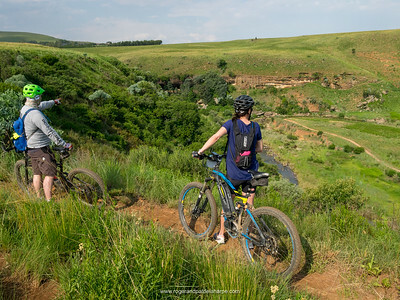 It was a spur of the moment thing really: We needed to pop up to Harrismith in the Free State (about a 2,5 hour drive) for a Saturday morning meeting and so we figured, why not make a weekend of it, take the bikes along, and try some of the trails at All Out Adventures. 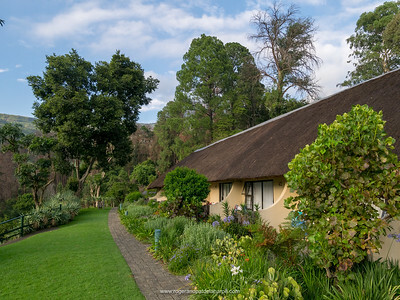 We could then spend the night at one of our favourite getaway spots - The Cavern Drakensberg Resort. A phone call to mates, Howard and Debbie revealed that they were keen to join and off we went..
After a rather splendid lunch we headed out to tackle one of the All Out Adventure trails. Rather than ride all the way to the trail head we picked up the trail on the side of the road and got right into it. We had chosen one of the “moderate” routes: Montusi Gorge - a 20km ride, right there in the valley. The route markers were colour coded and it was easy tracking it along the well maintained trails. If you are an experienced rider, it would be a relatively undemanding ride but for the beginners amongst us it was a little more challenging with some steepish climbs, rocky sections and a section along the edge of a cliff that will get those suffering from acrophobia a little unsettled. We thoroughly enjoyed the ride even though it was cut a little short by the arrival of a ‘Berg storm. Discretion won and we hightailed it back along the tar road to safety at the Cavern, a hot shower and a delicious dinner. The area is definitely worth exploring on mountain bikes though. Kerkenberg is nearby and would make quite a nice ride, albeit on farm roads. 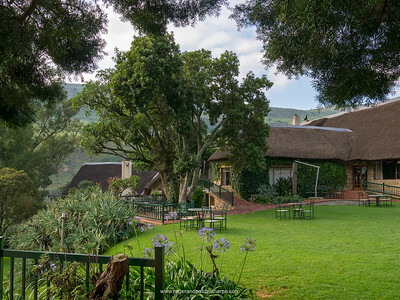 It’s where Piet Retief’s’ people camped while he went to Zululand to meet with Zulu Chief Dingaan. It’s called Kerkenberg because the Voortrekker minister, Erasmus Smit, declared that the cluster of rocks at its base was worthy of a church.